INTRODUCTION: Laparoscopic adjustable gastric banding (LAGB) has become one of the most popular bariatric surgeries performed today. Percutaneous access of the port for adjustment is required during follow-up but can be difficult in some patients with very thick abdominal wall. In these patients, fluoroscopic guidance has been used to localize the port and guide access. We present a novel use of office ultrasound to localize the port and facilitate the adjustment procedure. 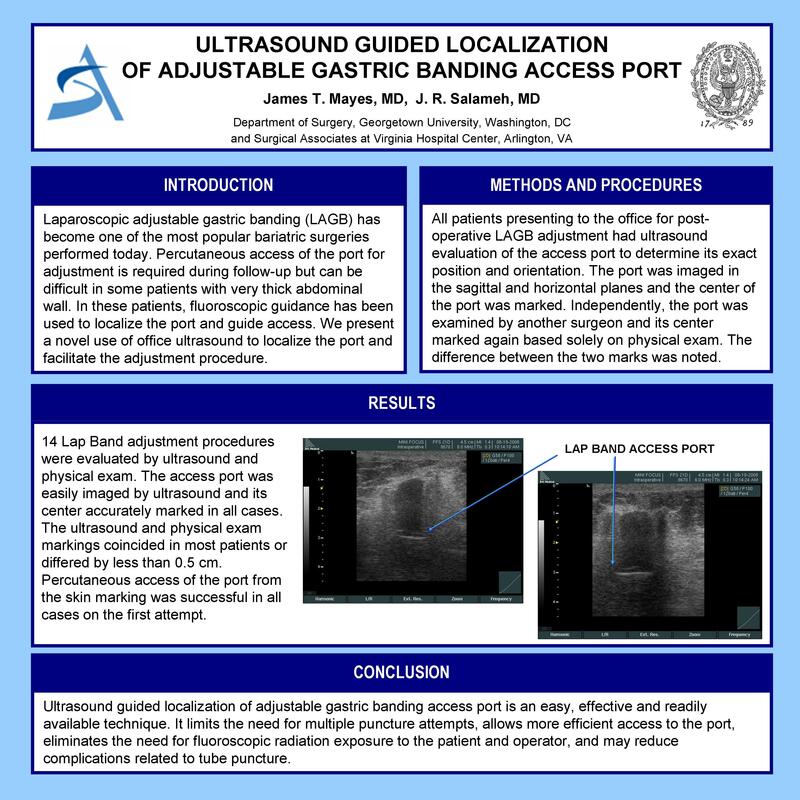 METHODS AND PROCEDURES: All patients presenting to the office for postoperative LAGB adjustment had ultrasound evaluation of the access port to determine its exact position and orientation. The port was imaged in the sagittal and horizontal planes and the center of the port was marked. Independently, the port was examined by another surgeon and its center marked again based solely on physical exam. The difference between the two marks was noted. RESULTS: 14 Lap Band adjustment procedures were evaluated by ultrasound and physical exam. The access port was easily imaged by ultrasound and its center accurately marked in all cases. The ultrasound and physical exam markings coincided in most patients or differed by less than 0.5 cm. Percutaneous access of the port from the skin marking was successful in all cases on the first attempt.. CONCLUSION: Ultrasound guided localization of adjustable gastric banding access port is an easy, effective and readily available technique. It limits the need for multiple puncture attempts, allows more efficient access to the port, eliminates the need for fluoroscopic radiation exposure to the patient and operator, and may reduce complications related to tube puncture.